About one-quarter of Canadian adults and more than one-third of adults in the United States are obese. Obese children are at risk of becoming obese adults and can experience immediate health consequences such as psychosocial stress, elevated blood pressure and cholesterol, and abnormal glucose tolerance. Monitoring trends in childhood obesity is important in order to assess interventions aimed at reducing the burden of obesity. A new NCHS report looks at the prevalence of obesity among children and adolescents in the United States and Canada. In the late 1970s, the prevalence of childhood obesity was the same in Canada and the United States, but recently the prevalence is 4.5 percentage points higher in the United States than in Canada. No change has been seen over the last decade in the prevalence of obesity among children and adolescents in Canada or the United States. The prevalence of obesity among children and adolescents aged 3–19 in Canada was lower (13.0%) than in the United States (17.5%) in recent years. 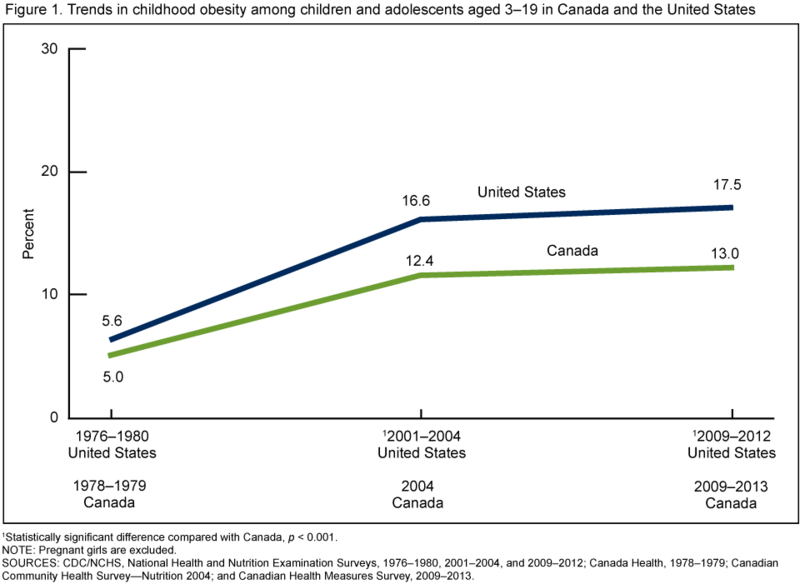 There was no difference between Canada and the United States in the prevalence of obesity among children aged 3–6 years. In the non-Hispanic white population, the prevalence of obesity among girls was lower in Canada than in the United States, but there was no difference between the two countries among boys. Click on map for individual state data in PDF format. NCHS has started a new Vital Statistics Rapid Release (VSRR) program that provides access to the most timely vital statistics for public health surveillance, through 1) pilot releases of Quarterly Provisional Estimates and 2) Special Reports based on a current flow of vital statistics data from state vital records offices. Using the provisional data, NCHS is able to produce much more timely estimates of important health indicators for public health practitioners, researchers, and health policy-makers than would be possible using final annual data. In this first pilot release of Quarterly Provisional Estimates, NCHS presents estimates of death rates for seven selected causes of death for 2013 and 2014 and the first quarter of 2015. This is the first public release of any mortality data for 2014 or 2015. The estimates are based on all death records received and processed by NCHS as of June 21, 2015, and will be updated each quarter as new provisional mortality data become available. The seven selected causes of death included in this pilot release are influenza and pneumonia, heart disease, human immunodeficiency virus (HIV) disease, falls (for persons aged 65 and over), stroke, Alzheimer’s disease, and diabetes. These causes have been selected based on their importance for public health surveillance and the feasibility of rapidly producing accurate estimates using the available provisional data. The causes are limited to seven in this first release to maximize timeliness. Additional causes of death based on provisional mortality data, such as cancer, suicide, and drug poisoning-related deaths, may be added in upcoming quarterly releases after evaluation using the same criteria. Selected estimates based on provisional birth data will also be added in future releases after evaluation. A new NCHS Health E-Stat provides information on the percentage of U.S. adults aged 65 and over with osteoporosis and low bone mass at the femur neck or lumbar spine, using data from the 2005–2010 National Health and Nutrition Examination Survey. 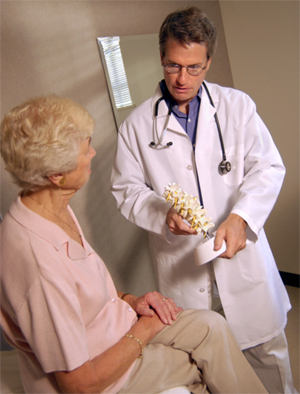 During 2005–2010, 16.2% of adults aged 65 and over had osteoporosis at the lumbar spine or femur neck. The age-adjusted prevalence of osteoporosis at either skeletal site was higher among women (24.8%) than men (5.6%). The unadjusted prevalence was higher among adults aged 80 and over (25.7%) than for adults aged 65–79 (12.8%). The age-adjusted prevalence of osteoporosis was highest among Mexican-American adults (24.9%), followed by non-Hispanic white adults (15.7%), and was lowest among non-Hispanic black adults (10.3%). A new report from NCHS presents selected estimates of health insurance coverage for the civilian noninstitutionalized U.S. population based on data from the January–March 2015 National Health Interview Survey (NHIS), along with comparable estimates from the 2010–2014 NHIS. Estimates for 2015 are based on data for 26,121 persons. The number of uninsured personscontinued to decline from 2013. Inthe first 3 months of 2015, 29million persons of all ages (9.2%)were uninsured at the time ofinterview, 7 million fewer personsthan in 2014. Among adults aged 18–64, thepercentage uninsured decreasedfrom 16.3% in 2014 to 13.0% inthe first 3 months of 2015. Therewas a corresponding increase inprivate coverage, from 67.3% to70.4%. Among children under age 18years, the percentage with privatecoverage increased from 52.6% in2013 to 56.3% in the first 3 monthsof 2015, reversing a 14-year trendof declining rates of privatecoverage. Among those under age 65, thepercentage with private coveragethrough the Health InsuranceMarketplace or state-basedexchanges increased from 2.5%(6.7 million) in the last 3 months of2014 to 3.6% (9.7 million) in thefirst 3 months of 2015. A new NCHS report presents 2013 period infant mortality statistics from the linked birth/infant death data set (linked file) by maternal and infant characteristics. The linked file differs from the mortality file, which is based entirely on death certificate data. The U.S. infant mortality rate was 5.96 infant deaths per 1,000 live births in 2013, similar to the rate of 5.98 in 2012. The number of infant deaths was 23,446 in 2013, a decline of 208 infant deaths from 2012. From 2012 to 2013, infant mortality rates were stable for most race and Hispanic origin groups; declines were reported for two Hispanic subgroups: Cuban and Puerto Rican. Since 2005, the most recent high, the U.S. infant mortality rate has declined 13% (from 6.86), with declines in both neonatal and postneonatal mortality overall and for most groups. In 2013, infants born at 37–38 weeks of gestation (early term) had mortality rates that were 63% higher than for full-term (39–40 week) infants. For multiple births, the infant mortality rate was 25.84, 5 times the rate of 5.25 for singleton births. In 2013, 36% of infant deaths were due to preterm-related causes of death, and an additional 15% were due to causes grouped into the sudden unexpected infant death category. Increasing time since diabetes diagnosis is strongly associated with severe vision loss. A comprehensive eye examination by an optometrist or ophthalmologist at least annually or biannually is recommended for persons with diabetes, to identify changes in the blood vessels of the retina. The effectiveness of treatment is well established, warranting screening for diabetic retinopathy and for assessing retinopathy progression. However, the use of select health screenings and therapeutic services may be less common in younger adults with diabetes. 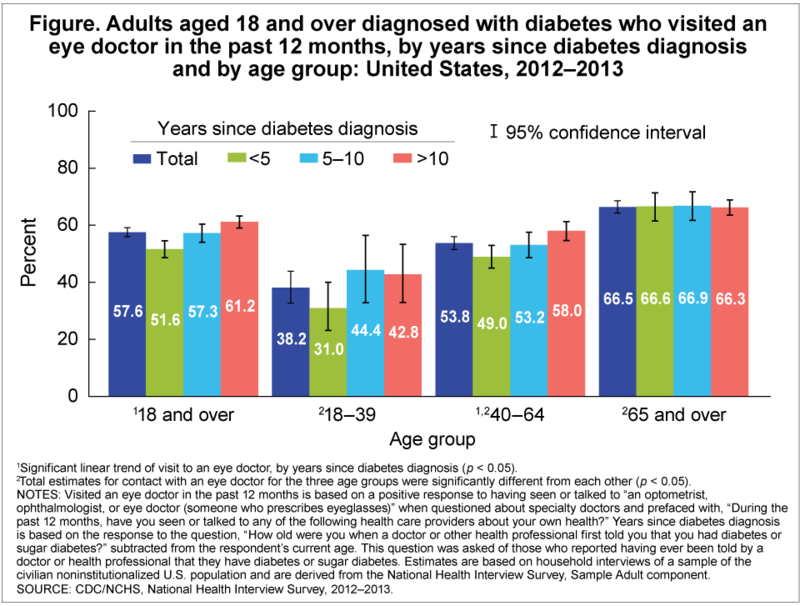 A new NCHS Health E-Stat provides information on the percentage of U.S. adults with diagnosed diabetes who visited an eye doctor in the past year, by years since diabetes diagnosis and by age group, using data from the 2012–2013 National Health Interview Survey. Survey respondents were asked about having seen an “optometrist, ophthalmologist, or eye doctor” in the past year, but they were not asked about the services provided at the visit (including assessment of retinopathy). You are currently browsing the NCHStats blog archives for August, 2015.